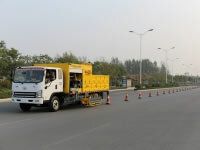 Gaoyuan offers clients a wide array of road maintenance equipment for sweeping, maintenance, crack filling and sealing. 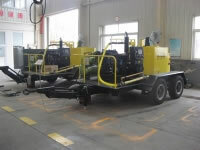 We also offer customization services on all road maintenance equipment. Road Sweeper Truck Road sweeper trucks are primarily used to remove debris such as concrete bleeding, clay and floating dust, as well as sweep the pavement milled by the milling machine. 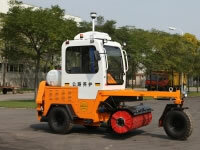 If the brush plate is replaced by nylon brush plate, road sweeper trucks can also be used for daily pavement sweeping. Traffic Cone Placement and Retrieval Vehicle Traffic cone placement and retrieval vehicles are a piece of specialized equipment used to automatically place traffic cones on the pavement. Taking actual client needs into consideration, this vehicle is designed not to cross the edge line, and is also designed to move at slow speeds. The distance between traffic cones is customizable between 2 and 10 meters. 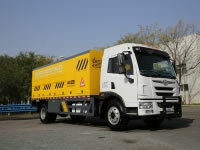 Asphalt Pavement Maintenance Truck The asphalt pavement maintenance truck utilizes 100% of waste materials in asphalt pavement, cold material, milling material and more, using them as the raw materials for recycling. The asphalt pavement maintenance truck also mixes fresh materials (asphalt and aggregate) into asphalt concrete. By doing so, precious paving materials are saved through recycling, and pollution is eliminated, and transportation costs are reduced. Crack Filling and Sealing Equipment With a stable operation, the crack filling and sealing equipment is used for filling and sealing cracks in pavement, thus preventing surface water from penetrating the asphalt, and accelerating crack expansion.This equipment uses a fully automatic control combustor with an excellent safety, stable operation, high heating efficiency and low environmental pollution. Crack Sealing Equipment With a stable operation, the crack filling and sealing equipment is used for filling and sealing cracks in pavement, thus preventing surface water from penetrating the asphalt, and accelerating crack expansion.This equipment uses a fully automatic control combustor with an excellent safety, stable operation, high heating efficiency and low environmental pollution. 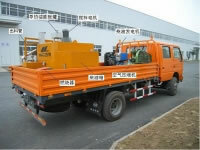 Road Repair Truck Road repair truck can be used to spray multiplex organic hydraulicity materials (MOH). MOH has all the features of flexible materials like asphalt mixtures, as well as the features of rigid materials like cement, making it an ideal material for asphalt repair applications. The wear-resistant blades on the mixer are welded using hard alloy particles for a better mixing effect. 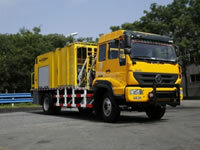 Multipurpose Road Maintenance Truck Multipurpose road maintenance trucks are specialized equipment for special operations. 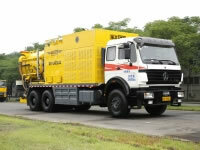 They use a single generator and hydraulic transmission, with the generator providing power for all operations, including traveling, and ensures normal operation under any conditions. Road Groove Cutter Road groove cutters are primarily used for groove cutting when handling cracks in asphalt and cement pavements. It utilizes its blades to quickly turn cracks into a uniform groove in order to form a new joint surface. Used with crack filling and sealing equipment, the road groove cutter widens and cleans cracks to prepare them for filling and sealing. Road Maintenance Truck for Porous Asphalt Pavement The road maintenance truck for porous asphalt pavement is used to clean and maintain the porous asphalt pavement for stable drainage and a long service life.The cleaning system uses the combination of fan shaped spray and point spray, allowing the high-pressure water to clean every corner inside the pavement. Along with the cavity effect, the pavement interior is thoroughly cleaned without damage. 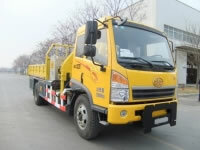 Road Maintenance Truck with Asphalt Heater As one type of multipurpose road maintenance equipment, the road maintenance truck with an asphalt heater is used for transferring hot asphalt mixtures and double heating the cold asphalt mixtures, in order to repair the cracks, upheaval and subsidence on the pavement. 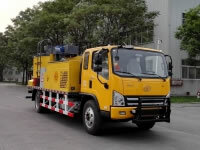 Equipped with a road roller, the road maintenance truck with an asphalt heater is suitable for long distance transportation. 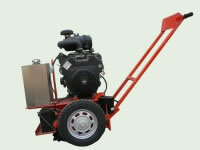 Gaoyuan Road Maintenance Equipment, was established in 2004 as a road maintenance equipment manufacturer. We are specialized in providing a comprehensive line of road machinery for road construction, asphalt maintenance and rehabilitation applications. Supported by 5 standard factories, and over 270 manufacturing and testing equipment, Gaoyuan can provide complete road maintenance machines and solutions in customer demands.